Start stir fry night with the crowd-pleasing and healthier noodle loved by families all over America. 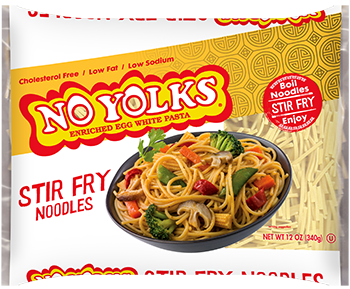 No Yolks® Stir Fry noodles have a rectangular shape and are the perfect length for a stir-fry dish. Pair them with a lean protein like chicken or tofu, add some veggies and your own stir fry sauce and you can have an amazingly healthy and delicious meal you can whip up on a weeknight. Look for No Yolks® Stir Fry Noodles in the noodle aisle, next to your other favorite No Yolks® noodle. Semolina (wheat), durum flour, (wheat), egg whites, niacin, ferrous sulfate (iron), thiamin mononitrate, riboflavin, folice acid.